Made this LO this afternoon with a photo of Nina. 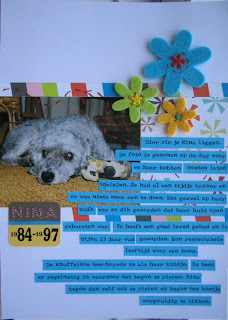 She was a poodle and stayed with us for more than 12 years. She was a really nice dog! At the end she had a big tumor on her belly that bursted open. She had the tumor for years but she couldn't be operated because of a heartcondition. The vetenerian told us it was better that we put her to sleep because she was in pain. Well, she was almost 13 years old and that's a respectable age for a dog! The little cow you see on the photo in front of her was her little baby. When she took it in her mouth it made a squeaking sound and than she would make the same noise. After that she started to lick the cow very carefully. It was funny! oh no. poor dog but this layout is a nice tribute to remember her. love the felt flowers.